Overall I found this a useful and informative book, with good information.I would be a bit reserved in recommending it by itself because of the strong and very subtle slant. (One of the authors is the head of Obstetric Anesthesiology at a large hospital, and he's very pro-drug) The writing comes across as very scientific, factual and unbiased, but he ignores or glosses over side effects of epidurals, misquotes the C-section rate with over 200% error, and uses negative, condescending language describing women who prefer to give birth without drugs. (ie "Trying to be a hero" and "prefer to use nothing more high-tech than the massage setting on the shower head")On the other hand, he does cover "CAM" treatments fairly positively, and gives pros and cons for many available options (even if he omits or downplays some cons on epidurals) and makes a clear and important distinction between epidurals, spinals and narcotic injection that is ignored by many "anti-drug" writers. It's really nice to get information from the "other side" since it seems many common books on pregnancy and childbirth have a "natural" slant. Since most women accept some sort of medication for labor, it seems pertinent to include information that informs with this in mind and represents a more mainstream point of view. Since he was so persuasive and subtle, I would not recommend this without including some other book that describes more of the realities and pitfalls of how the establishment usually works (this book tends to mostly describe best case scenarios, referencing studies with 10% C Section rates rather than general mainstream drug-using hospital results, like the 32% national average C-section rate we currently experience in the US). My favorite is Pushed: The Painful Truth About Childbirth and Modern Maternity Care which also references a lot of studies and scientific material. I would really like to see a book that examines evidence and assertions from both sides and reconciles them, since they seem rather contradictory. This would be a great one to read if you are pregnant with your first child. You just have no idea what to expect, and this book tried to be as objective as possible while answering the question: "How much does childbirth hurt?" I've read quite a few books about natural childbirth, which all pretty much espouse the idea that childbirth doesn't have to be painful, and that "pain" is caused by our expectation of pain and fear, which causes tightening of muscles (instead of the necessary relaxation) which causes pain, which increases our fear, and the cycle continues. This makes tons of sense when you've never given birth before. Now that I've done so naturally, I don't buy the idea that the pain I experienced was a result of tension and fear. I'm pretty confident it was a result of my birth canal and perineum being stretched out to freakish proportions in order to accommodate the passage of a bowling ball-sized baby. Anyway, I liked that this book tried to be realistic without freaking you out. Furthermore, there are many, many different pain-relief techniques discussed (traditional as well as alternative) and a very good synopsis of each is provided, along with personal experiences of moms who have used those techniques. Since this is my fourth baby (and, as I said, I've read a lot of other books on the subject) I gleaned very little new information. But I still think it was a generally well done book. I don't know that it can guarantee you "easy labor" as the title suggests, but it will definitely give you a lot of information that could help. This book was written by an anesthesiologist at a major hospital, and when you're an anesthesiologist, everyone looks like they could use an epidural. The book definitely takes the position that other than for scheduled c-sections (where spinals are used), the epidural is the preferred choice in pain relief. And having received an epidural with each of my prior deliveries, I'm apt to agree. However, there are other options, and the author discussed them as well. I do wish he'd gone a bit more into depth with some that seemed to work really well (hypnosis?) because I wonder if the awesome-pain-free-birth-with-hypnosis thing was an anomaly or more common.Mentions the need for flexibility (like if you go to deliver and the anesthesiologist is on-call but not on-site) in waiting for pain relief or in deciding to NOT accept pain relief. Book is also a little outdated (published 2006), in that he states only 25% of US deliveries are cesarean, while nowadays the number is north of 30%.Also, it may have been my copy, but this book was missing more periods than the typical pregnant woman. Just less-than-stellar editing there. I found this book helpful as it broke down and summarized the most commonly available pain relief methods for labor. It contained both medical and alternative options, and listed both the benefits and negative points for each item. I skimmed through some sections, just reading the bits about what possible negative effect it could have on my baby and then deciding if I wanted to further research that particular option. It did not give details as to how to best implement any particular method, but gave you what you needed to do further research on your own, along with personal stories from medical professionals and people who use and implement these pain relief methods. I found the opening chapter on epidurals extremely helpful and informative. The bias in this book was terrible. It should have been labeled as an advertisement for the epidural. I was hoping to read something balanced but this book leaned so far towards the medical perspective that I often found myself frustrated. Although some of the stories that were included were helpful, they all started to sound the same. The majority of the stories were either about women who couldn't see the sense in suffering pain and knew they wanted an epidural or stories about women who were shocked about the amount of pain and then received the epidural. There were no labor stories about bad epidural experiences or about women who had an epidural and didn't like the experience. I know that this isn't that uncommon because I have many sisters and friends who have received epidurals and have been unsatisfied with their experience. There were very few successful natural childbirth stories and I also found it strange that the authors only included successful hypnobirthing stories. This book was in no way helpful in my quest for helpful non medical pain relief options. The chapters that focused on these options only gave vague suggestions and often overshadowed the suggestions they did give by including disappointing birth stories. I also found the parts that emphasized the importance of women being educated about childbirth completely unnecessary. If someone is reading this book, they are not going to fall into that category.There were some redeeming parts to this book. I feel like I learned a lot more about the different medical options for pain relief and will be more informed if I opt to go for that route. Although the chapter about the history of pain relief during childbirth wasn't necessary or helpful, I actually liked it and found it fascinating. Even though I don't feel like this book helped me as much as I was expecting, I still found it somewhat helpful. Would I recommend it to others? Probably only to those who know they want an epidural. Otherwise, I'm sure there are other books that can give the same information about the epidural and be more balanced in their approach. This book left me feeling like the only way to a happy childbirth experience is to have an epidural. While Easy Labor is very comprehensive, it's never repetitive or overwhelming or lofty in vocabulary. So that's good. However, I also felt that it was pretty biased toward pro-medical pain relief intervention.I'm of the "knowledge is power" camp. The more I know, the more reassured I feel. The hubby and I recently took childbirth prep classes and he seemed pretty overwhelmed with the details. I walked away feeling much less stressed about my impending labor and delivery. So to each their own. That's why I loved this book, and would recommend it to other women in the "knowledge is power" camp. It covers, in detail, what to expect during each stage of labor, delivery, and recovery. Everything from how long to labor at home to what will happen when you do arrive at the hospital. The authors also suggest some comfort items that you could consider bringing from home, like a big fitness ball. Mostly, though, the authors cover what medical pain relief options are available at each stage. They do cover them all fairly, telling the reader of the potential side effects on both mother and baby, and of how the various medicines will impact labor. (For example, your movement will be severely limited if you receive an epidural, so you won't be able to easily shift position or walk to assist in the labor process. )I also know that reading worst-case scenarios may scare some people... but even with that, I would still rather know ahead of time than be surprised! So I appreciated the chapter on emergency c-sections. Now I can make decisions about regular c-section and/or emergency c-section with my hubby before we're in the emotional throes of labor. While I am hoping to avoid as much medical intervention as possible, I did find it reassuring to be able to know all my options in order to make decisions beforehand. I also appreciated that the authors invited many doctors, medical professionals, and new mothers to submit their birth stories so that the reader gets many perspectives. Interesting and informative...to a certain extent. I liked the brief chapter on the history of medical techniques to relieve labor pain, and I appreciated the many birth stories included in the book. The authors diligently tried to include the full spectrum of medical professionals, from obstetricians to doulas to labor and delivery nurses. The takeaways are summarized at the end of the book, and boil down to a few simple points: educate yourself on your options and on what the process may be like; trust your caregivers; trust yourself; be flexible--things may not go like you planned. I think these points are solid, but I didn't really learn them for the first time by reading this book. 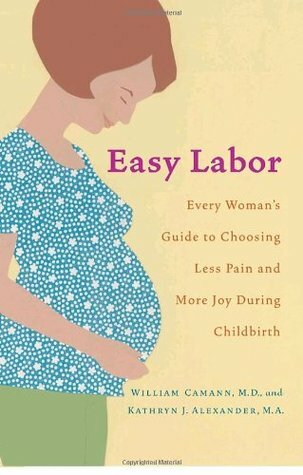 I was drawn to the title of course: who wouldn't choose an "easy labor" with "less pain and more joy?" However, as others have mentioned, this book argues (indirectly, through its curation of birth stories and professional opinions) that the best choice is the epidural, which is safe, effective, and without complications. In fact, the book seems to suggest, why would women choose to labor in purposeless pain (extreme pain that they are unprepared to cope with!) when there is a miracle option?? While the information on this book contributed to the knowledge base I'm trying to build before my own first labor, it did leave me uncertain about the purpose and value of labor pain. It also contributed to anxiousness and doubt about whether I am adequately preparing to cope with the pain; perhaps it's even worse than I thought! I would say that this book is a worthwhile read if only to store away more opinions and more birth stories, but it should not be the only source, since it puts no real stock in "alternative" methods but seems to view the epidural as the sensible and inevitable choice most women ultimately make. Great book for a balanced perspective on labor pain management for either natural birth or birth with medical pain interventions. The book provides an excellent overview of all options available, in addition to evidence-based medical information-- something I seriously found lacking in other books on labor and delivery. It doesn't have the patronizing, condescending "hey girlfriend, look, you're pregnant, isn't that just darling?" tone that many other L&D books have; rather, it provides factual medical information as well as perspectives of medical professionals ranging from OB-GYNs, nurse anesthesiologists, and midwives to doulas, including a helpful section of birth stories from these professionals who have gone through it themselves. The book does not take any position on the natural birth vs. medical intervention debate, but lays out all the facts and allows the reader to decide for herself. Coming from a public health academic background, I really appreciated all of the factual, evidence-based medical information, but I also found it very easy to read for someone without a medical/health background. It also helps de-mystify the process of what happens when you go into labor and what pain management options are available during each point. Regardless of what ultimate birth strategy you decide to use, this is a highly informative, well-written book, and one I'll be giving every first-time mom I know. I thought that this was a fairly balanced book. There seems to be so much bias on the issue of labor pain that it's hard to find anything that even seems to represent both sides, and I think this book is about as good as it will get. There is bias of the author toward use of medication, but I can only imagine how frustrated doctors feel when they have a patient come in and say they want no interventions but be completely ill-prepared for the pain/exhaustion of labor and and lack having mastered any CAM techniques (let alone more than one). The woman is then not be able to make an educated decision about pain relief because she refused to even acknowledge the possibility of interventions. This book helped to ease my rigid long-held view of unmedicated birth being the ideal. It talked about a woman feeling in control as being a direct indicator of her satisfaction with her birth. I like that it explained many types of pain control options/techniques and even encouraged all women to learn CAM approaches for at least the beginning of labor or in case something should happen during labor where medication is not effective. I highly recommend this book to any expecting mother whose goal is the educate and thus empower herself to make informed, healthy decisions before and during birth. It clearly informs the reader about different types of labor support available (ie the roles of partners, doulas, obstreticians, midwives, anesthesiologists, family physicians, labor/delivery nurses) and different locations for birthing (home, birthing center, hospital). It also thoroughly discusses different positions of the baby in the womb, available drugs and their effects during labor, alternative, traditional, modern and historical methods of pain relief, common fears associated with childbirth, vaginal births and C-sections. It includes birth stories of care-providers and of patients, some stories entailing medical extremes and some depicting more normal circumstances. The information is evidenced by statistics, surveys, and other foot-noted resources. This book can be read by skipping around or by going cover-to-cover. This is exactly the birth book I have been looking for. No bias as to which method of pain-management is better, just straightforward, detailed information about the most common forms of pain management used in today’s delivery rooms. For every type of pain-management technique, this book tells you what it is and what it does, how it is done and how it feels, medications used (if any), when it is available, reasons you may or man not choose to use that particular technique, how it involves your partner, potential benefits and limitations, and possible side effects for mom and baby. There are also birth stories for all of the techniques and a great section at the end about what pain-management techniques OBs, midwives and doulas have chosen for themselves and their advice about how to have the birth experience you want. The undertone to the whole book is “Be informed, and be flexible.” I can’t think of a more common-sense approach to childbirth.Borrowed from the public library. Despite the annoying/stupid title, was one of the more balanced books on childbirth. The author is an anesthesiologist at a major hospital, so obviously has as much of a bias as all of the natural birthing books, but there is a definite effort to represent all options for pain relief. The only snarky bit that comes through is the con listed for some interventions - something about "not good for the mother who wishes to use no more advanced technology than the massage setting on a showerhead." I'd say the main things that I took from this are the info on different kinds of epidurals, that getting a one-time shot to avoid an epidural could actually expose an infant to more medication, and the point that in no other medical situation are people asked to simply tolerate pain or discouraged from wanting pain relief. Like any book, just a starting point for a conversation with one's physician, but a different perspective than many of the childbirth books. This book provided a good summary of ALL the pain management techniques (natural and medical) for childbirth along with the research-based pros/cons of each. It's definitely skewed more towards the medical perspective, but in a way that didn't pass judgement on natural methods. The book was published in 2006, so obviously not the most up-to-date research, but very helpful nonetheless. This book really helped me make decisions regarding pain relief for birth. It also has helped me feel much more informed about all the options available so that I can go into the birthing process with a well-thought out plan while simultaneously being open-minded and flexible. Ultimately, I recommend it to anyone wanting to be informed about all the options out there for childbirth. I know what I was thinking when I started this book, "Right, and jumbo shrip." What an oxymoron. Then, Carolyn and my boss both shrugged (I think Car shrugged anyway, we were on the phone), and said, "It's not that bad. I read this whole book even though the parts on repeat labor and twins did not apply. It was all right. From my 2 pregnancy books read thus far, Belly Laughs is better. This gives an overview of options for those seeking medication and those seeking without, and then everyone's opinion on everything. Apparently many women are very fearful about labor/deliver. I almost wish I hadn't read it; I didn't know that was something to be afraid of. Great. Informative but not inspiring or compelling. For any woman seeking to learn more about her options of pain relief during labor/delivery, this book gives very helpful information about the main options. It describes what types of medicines are available, how they work, how they are administered, what their side effects are, etc. It also discusses other options if you prefer not to use medications. Some of the methods covered are hypnobirthing, waterbirthing, use of the birthing ball, etc. The nice part of this book is that it allows you to make you own decisions. It gives perspectives of a variety of healthcare practitioners as well as women who were happy or regretful of their decision to use the interventions. It's a very good book for the overview of options available. This was a really informative book on labor, labor options, and some real-life stories by both moms and those who help in the delivery process (from anesthesiologists to ob/gyns to midwives, to duolas). It didn't go into too much detail to scare me more than I already was, but left me feeling more informed about options out there, and didn't try to sway you one way or the other on the different delivery options. This book was very much about making you feel empowered and informed about the different options out there. Perhaps one of my favorite books for anyone about to give birth. It covers all the pain management techniques - from natural to medicated. There's no judgments about your choices and my favorite part was that it reported on scientific studies about how women (and babies) responded to the various choices. It also stresses that a woman should remain flexible in her choices - a woman that has chosen a medicated birth may not have that option, and a woman that has chosen a natural birth may have to reconsider. Definitely focused on the pain of childbirth and the ENTIRE catalog of ways to cope with it - from epidurals to aromatherapy. Good if you want/need education on the options available and the pros/cons of each. For me, I felt it was redundant with other information I had found, especially since I was already committed to a non-medicated birth. That said, if you are truly on the fence about what your options are and what each of them means, this is a great starting point - condensed info, easy to read, easy to navigate, not judgey. This book is pretty informative and balanced in the way it presents different options for labor. Reading it allowed me to form some opinions on what I do and do not want to happen during my first labor -- I didn't realize how little I knew about the process until I read this. The other thing that's great about this book is that it's formatted so you can pick it up, find the topic you need, read its pros and cons, and be done. You don't need to read the whole book because, seriously, who has time for that when you're pregnant and working? This book went systematically through the all the options women have for pain relief during childbirth. A brief overview of the history of this practice is given, and then they go through each kind of pain relief and how it works. I really liked the stories included by women who have used each method, whether their experience was positive or negative, and if they would recommend it or use it again. Guess what the only method was where every women who used it loved it and wanted to do it again? Hypnosis!